For those of us who are over concerned with the privacy and tracking issues with the Google giant, there has been many alternatives search engines that don’t track user activities. DuckDuckGo is a crowd-sourced search engine highlighting that they don’t record user activities. In their own words, “We don’t track or bubble you!” Now, if you use DDG frequently you can have your own personalized DuckDuckGo homepage using your Twitter account – here is how. Open DuckDuckGo.com, click settings and go to Look & Feel, you can the entire world. Supply your Twitter handle (without @). You can also fully customize DuckDuckGo and save it anonymously in the cloud which can be deleted later. 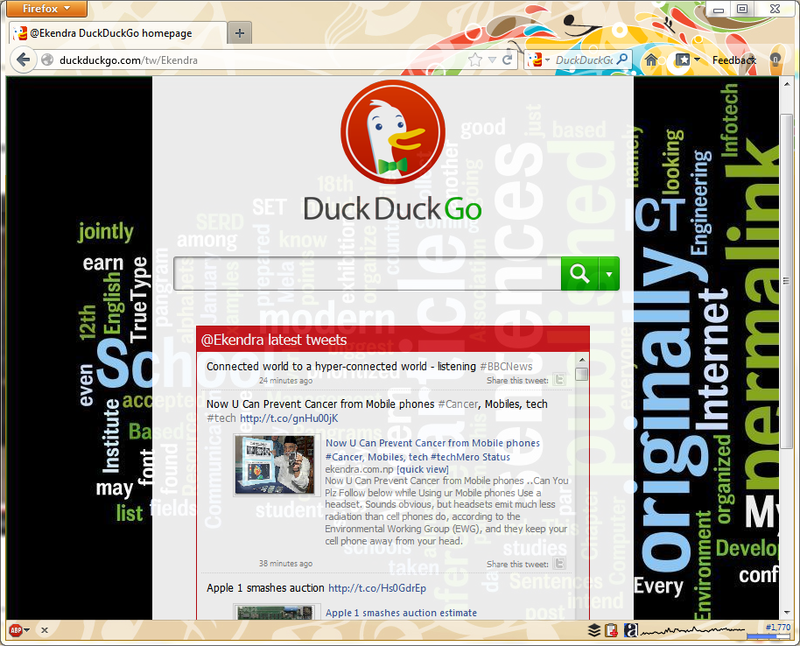 The personalized DuckDuckGo home page uses Twitter handle in the URI, like the one for me is: https://duckduckgo.com/tw/Ekendra. Related: How to add your blog or website to DuckDuckGo?